Look hard enough and you'll find a PC that's every bit as sleek as a Mac. You might not expect a company like PCNextday to deliver such a product, but this new Zoostorm looks great and is a powerful package - all for just £600. It's been launched as a universal family PC and this is where the Zoostorm excels, sporting built-in Wi-Fi and a TV tuner card. There's also a reasonably sized hard drive, 2GB of RAM and a 2.1 speaker set to complete the multimedia package. This Zoostorm is a real novelty in the PC market, shedding any evidence of black, grey and silver for a white sheen that'll suit the iPod generation down to the ground. Yet colour aside, the peripherals that make up this system are an odd bunch and on close inspection they don't quite match up. The micro ATX case is attractive with a handy slide-down panel, but the AOC 19-inch screen, Hiper keyboard and Sweex mouse all have a different gloss to them. This gives the unfortunate impression that the system has been somewhat cobbled together. Apart from the mouse, which is basic to say the least, the system components have been chosen sensibly and the AOC 195F monitor is one of the finest examples of the company's products that we've seen. Having said this, the monitor's bulky power supply will disappoint some people. Connectivity is at the heart of this machine and the feature set is impressive, minimising the need for you to fit additional elements. That's not to say that using the PC was an entirely smooth experience. The hybrid TV tuner card enables you to watch and record your favourite TV shows from digital Freeview or traditional analogue transmissions and you can use the media centre features of Windows Vista to quickly and easily navigate to your favourite channel. We couldn't test reception in our area, but the device appeared to function correctly and was easy to configure. The wireless was a different story however, let down by a poor wireless client that was confusing to operate and took a surprisingly long time to detect networks. The choice of motherboard is questionable and coupled with a basic PSU and stock CPU cooler, it means that the zStyle is a noisy computer. Despite its lifestyle looks, it won't fit the bill if you're planning on using it as a living-room PC. Furthermore, the motherboard and case size leave little room for upgrading, so this system may not serve you well in the future. Graphics aren't much to write home about, with the onboard graphics clocking in at just 286 using 3DMark. 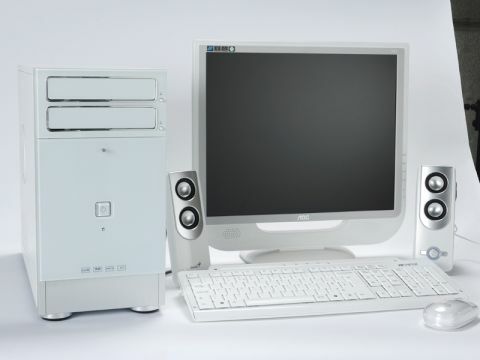 A CPU score of 1,968 proved much better and for general PC use without graphical demands the 2.33GHz processor sings. Spending £600 elsewhere will get you a similar amount of power, but you're unlikely to benefit from the TV or Wi-Fi functionality that's on offer here. For a no-hassle system that's got a unique look, the zStyle Premium Family PC is a good option. However, you may want to consider the upgrade options on the online build form before you commit, of which sellers like PCNextday are happy to discuss.